The International Rolex Regatta reflects in its name a tradition of attracting sailing teams from around the world, and from this perspective this year's event will prove to be the most diverse ever, with entries from the USA, Russia, Sweden, The Netherlands, Monaco and beyond. The three-day event, scheduled for 23-25 March, is hosted by St Thomas Yacht Club, which for 39 years has devoted itself to producing this regatta’s famed offerings: three days of high-quality racing and serious fun in an inspiringly scenic island atmosphere. The International Rolex Regatta is one of only two in a line-up of several springtime Caribbean regattas to host dedicated racing under the internationally recognised IRC handicap system, which results in some of the world’s best sailors and grand-prix racing machines finding their way to the starting line. Among them this year will be Lord Irvine Laidlaw and his new 52ft Reichel/Pugh-designed Highland Fling. Sailing with him will be America’s Cup notables Peter Holmberg, who is serving as tactician and also is renowned as St Thomas’ homegrown Olympic medalist and the USA’s Matt Wachowicz and Mike Toppa, serving as navigator and trimmer, respectively. 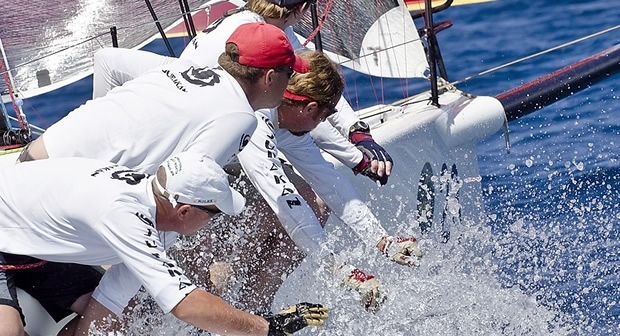 The remainder of the crew hails from Australia, the UK and South Africa, with most counting this as their first time competing at the International Rolex Regatta. Also racing under IRC will be International Rolex Regatta veteran Bill Alcott, who will be sailing his newly acquired Farr 65 Equation (ex-Rosebud). One of Karuba 5’s main competitors will be Bob Erixon’s 81ft Maxi Rothmans. Originally built to compete in the 89-90 Whitbread Round the World race, the legendary yacht has been restored to its original form and will be skippered by Sweden’s Klabbe Nylöf, with navigator Torsten Ulfeld and tactician Patrik Salén joining Erixon in the afterguard. Currently, the St Thomas Yacht Club anticipate dividing the fleet into two IRC classes, four classes for CSA (Caribbean Sailing Association) handicap racing and one each for IC-24s and Beach Cats. There is an 1100 AST start time for each day, beginning with Friday’s picturesque and traditional distance races from the east end of St Thomas to Charlotte Amalie Harbour and back. The tactically demanding Pillsbury Sound Race in and among the cays of St Thomas and St John is Sunday’s highlight. This 'Sunday drive' has decided final standing in most classes in each of the last five years. The culmination of the International Rolex Regatta’s lively competition is a presentation on Sunday of coveted Rolex timepieces to winners in select classes.